Tying a denim jacket around your waist (yup, the same way you did in 1997 on your 7th grade field trip– except this denim jacket doesn’t have Looney Tunes characters embroidered on it–hopefully) is my current fave way to add texture, definition, and grungy-ness to a look– kinda 90s, a little tomboyish, plus it adds a layer to your look when its too warm to actually wear the jacket! 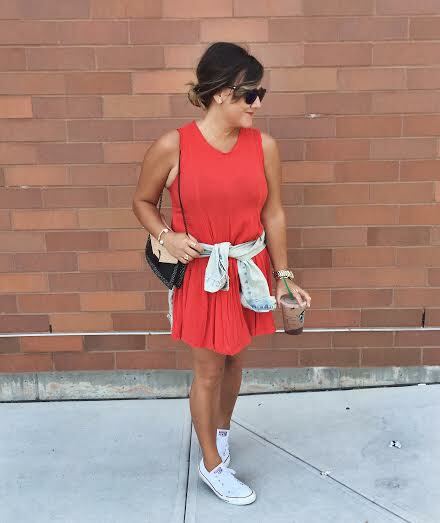 Especially if you’re wearing a dress that could use some definition around the waist or a color/texture breakup…try it! 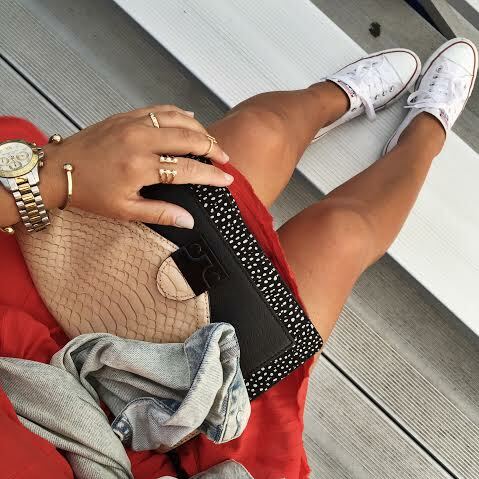 As always, sneaks, especially Converse, with a dress is typical for me here– prob my fave way to wear a dress (or with booties), so that the whole vibe is less precious. 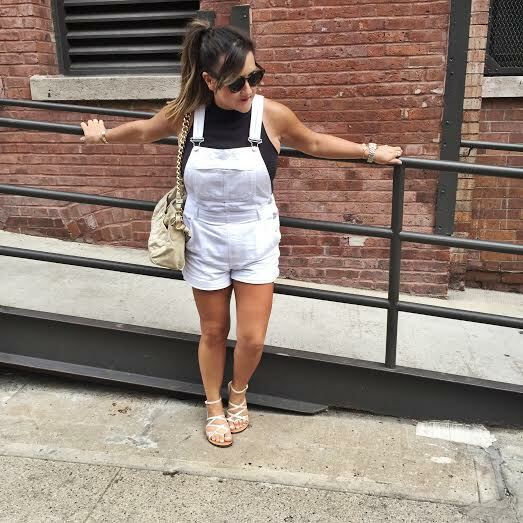 Two trends that will DEFINITELY carry into fall will be the mock turtleneck (I’m really pushing this one you guys…after years of low cut tops, this just feels super fresh and modern) and my faves, overalls. 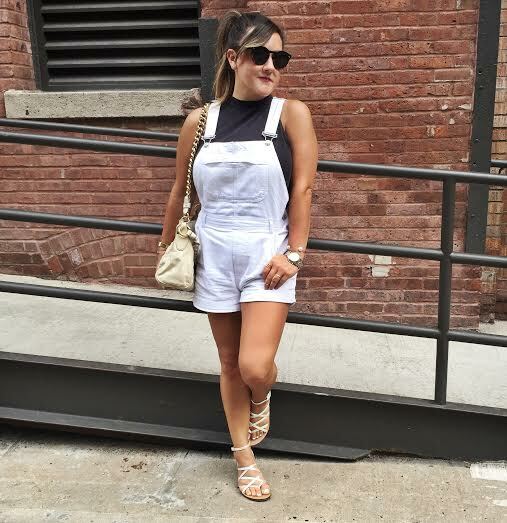 I recently picked up this pair of crisp white shortalls at Topshop for only $35 on sale (link HERE TO BUY) , and will def be wearing them on repeat during these final days of summer, before I bust out the long legged versions for fall. You guys are well aware by now that gold jewelry (my “littlegoldmix” wink wink 😉 ) is one of the mainstays of my look. I recently was introduced to Park Lane Jewelry, a company that has been making gorgeous costume jewelry for over 50 years. 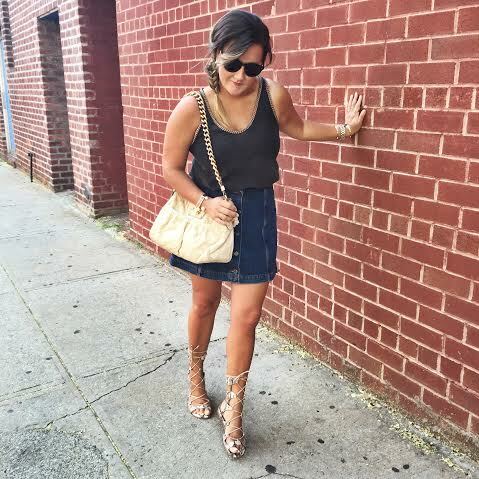 They have tons of different styles, looks and price points– literally, something for everyone. 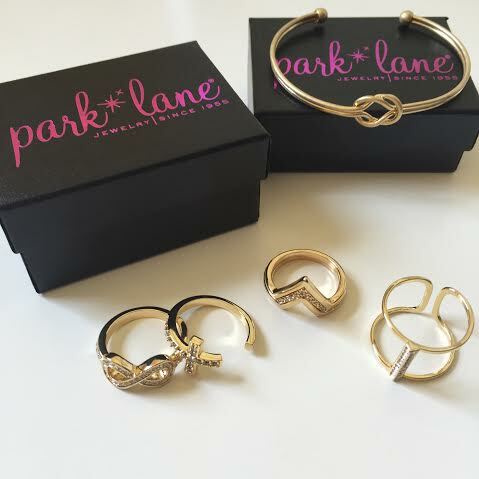 Above are just a few additions to my daily mix– make sure you check them out — Park Lane Jewelry! 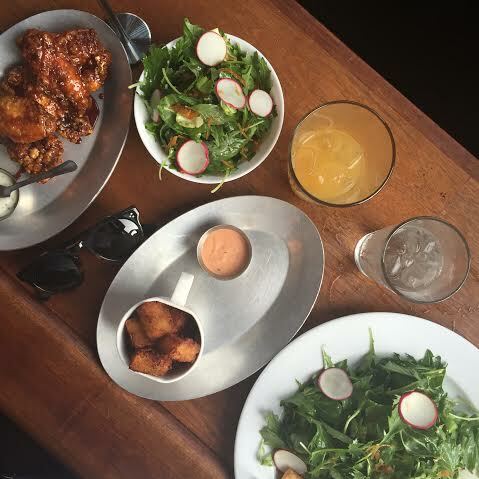 So my husband has been a chicken wing connoisseur for over twenty years– he recently found this restaurant in TriBeCa called Distilled— which supposedly had some of the best wings the city has to offer. According to him, (I’m not a fan of wings myself…too much work, not enough pay off if you ask me) these did not disappoint!!! Super crispy, meaty, and flavorful, he could have eaten “778347 more”. Oh, also their spring greens salad and tater tots were pretty bomb too– they also have a great selection of beers. 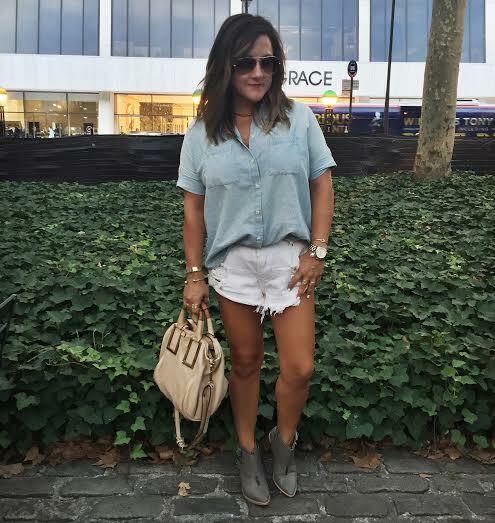 Ok, that’s all for now– make sure you stay tuned for lots of upcoming Fall fashion and NYFW posts! 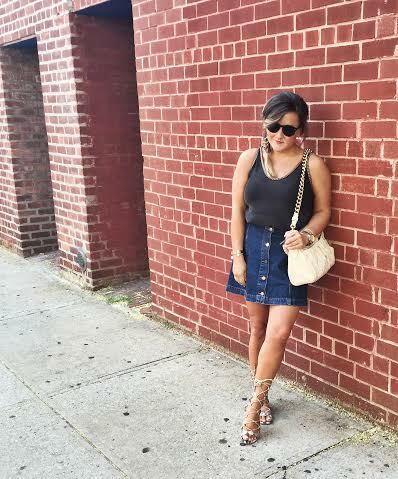 So I swore, no denim skirts, period, ever again. Because it’s either like 2000s bald Britney or an old Amish woman, with denim skirts, that is. 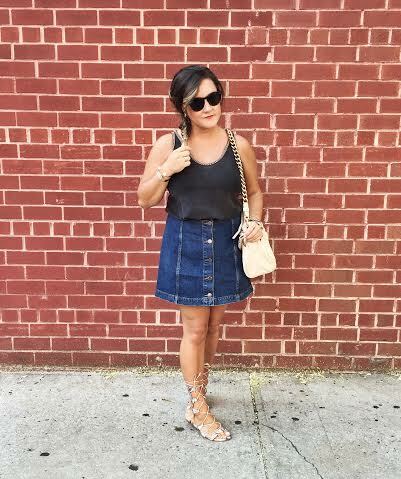 But, as it often happens in fashion , (and what I love about it best) the denim skirt has made a resurgence– and a pretty cool one at that. Right on board with the 70s vibe that came on strong last season and will continue to dominate this year, this “new” denim skirt has no bad Britney/Amish vibes attached to it– the A-line mini with buttons down front begs to be worn with flat sandals and a tank or tee tucked in now, loafers and booties with a cropped sweater or slim turtleneck come fall. It’s one of those fashion items that hits you upside the head and makes you reconsider your own “never agains” and simultaneously sparks ideas for lots of new outfit combos that feel fresher than ever. 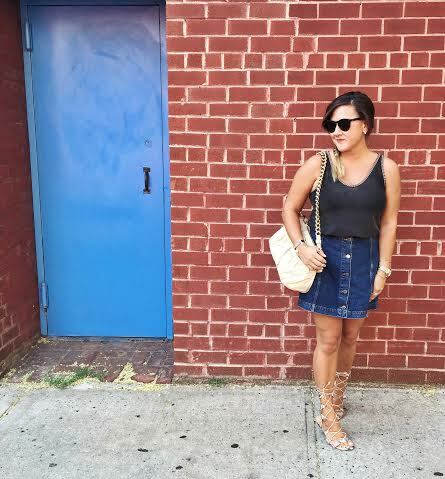 I’ve linked my exact skirt from Topshop above, and three similar options in varying price points below– happy skirting! 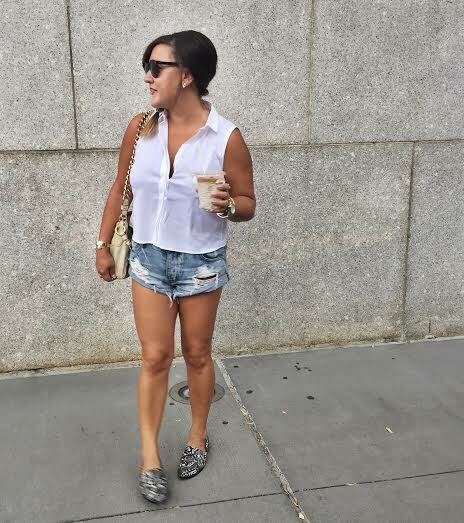 We spent the day museum hopping in the city yesterday, and since it was going to be 90 + degrees out, this Zara crop top (currently in stores!) 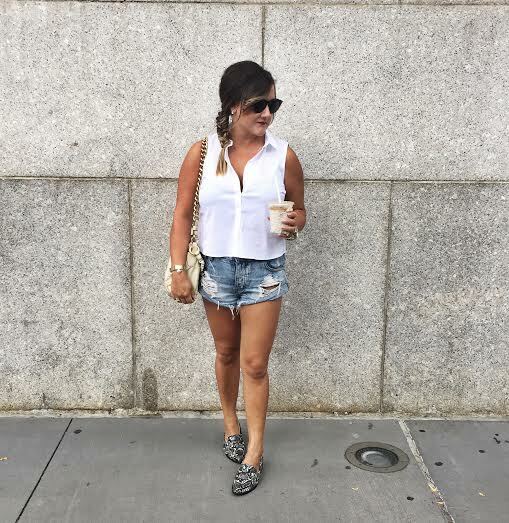 and cutoffs seemed like my best bet– plus I’ve been dying to bust out my new ASOS black and white snakeskin loafers (!!! ), and this simple outfit wouldn’t compete with them. I’m capital L LOVING the menswear – borrowed-from-the-boys vibe of a strong pointed mannish loafer these days– anything else flat wise feels too feminine for me right now. Plus, these withstood a full day of skipping around the city, including Citi-biking it down to TriBeCa. This Zara crop top is, for me, the only way I’ll probably do a crop top lol…tomboyish, classic, and not too, well, cropped lol. This one will transition (get ready to see, hear, read that word TRANSITION in every magazine, blog, store advertisement etc for the next month or so !!!) nicely into my fall wardrobe as well. 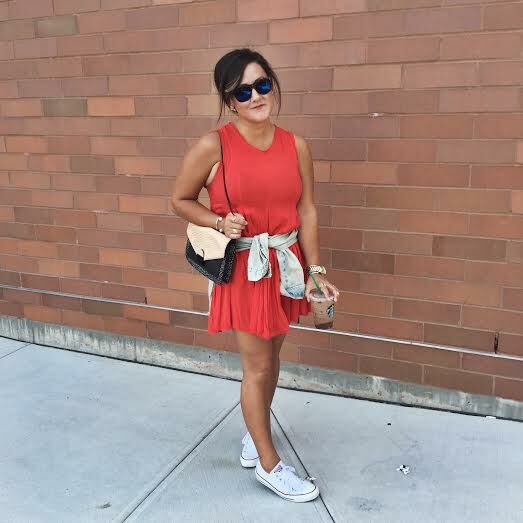 What’s a sentimental fashion item in your closet that you’ve reconnected with!? I’d love to hear about it! Comment below!